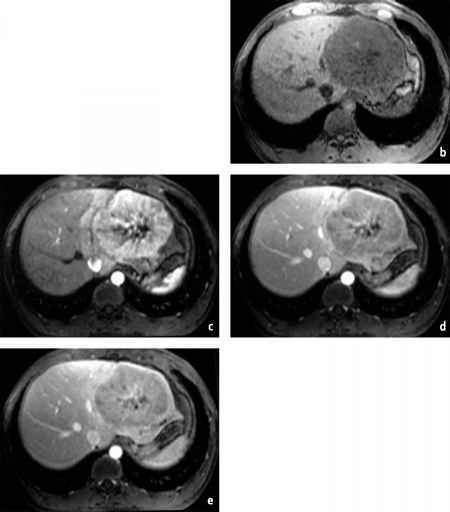 Fibrolamellär hepatocellular carcinoma (FLC) is an uncommon tumor with clinical and pathological features different from those of hepatocellular carcinoma . 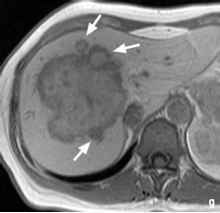 This neoplasm occurs predominantly in young adult patients, who have no history of cirrhosis or chronic liver disease . Macro-scopically, tumor size varies from 5 to 20 cm. The appearance of FLC is somewhat similar to that of focal nodular hyperplasia, with a central scar and multiple fibrous septa. Although hemorrhage is rare in FLC, necrosis and coarse calcifications have been reported in 20 to 60% of cases, especially in the central scar [20,25,39]. Most commonly, FLC is present as a solitary mass, although sometimes it may appear as bi-lobed or as a mass with small peripheral satellite lesions. Only rarely is FLC present as a diffuse multifocal mass. 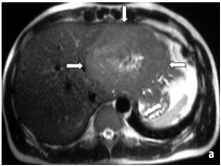 FLC lesions are usually intrahepatic, although sometimes pedunculated neoplasms may be found . Histologically, FLC is composed of sheets of large polygonal tumor cells separated by abundant collagen bundles arranged in parallel lamellae. The tumor cells have a cytoplasm that is deeply eosinophilic and granular due to the presence of mitochondria. Sometimes FLCs contain bile [6,72,77]. 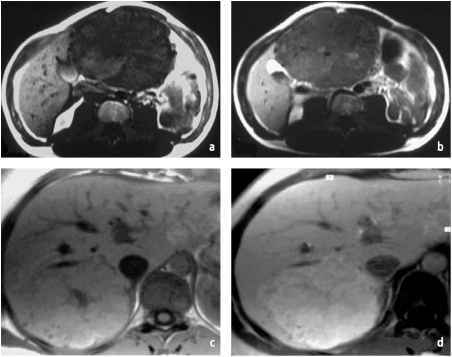 The clinical presentation is variable, although patients commonly have abdominal pain, hepatomegaly, a palpable right upper quadrant abdominal mass, and cachexia . Less frequently, the disease is accompanied by pain and fever, which simulates a liver abscess, gynecomastia in men, venous thrombosis, or jaundice. The gyneco-mastia is a result of the conversion of circulating androgens into estrogens by the enzyme aro-matase, which is produced by the malignant hepa-tocytes. Venous thrombosis can occur due to invasion of the hepatic venous system or the inferior caval vein. Alternatively, it may form part of a paraneoplastic syndrome (Trousseau syndrome). Jaundice is a very rare condition, and can be caused either by invasion or compression of the biliary vessels by the tumor or by compression of the biliary vessels by enlarged lymph nodes [1,25]. The echostructure of this neoplasm is variable on US scans. 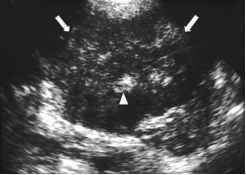 Often the tumor contains both hyperand iso-echogenic components, and thus is not homogeneous. The central scar, when present, is frequently seen as a central area of hyperechogenici-ty (Fig. 25) [10,66].
. On delayed phase images, parts of the non-necrotic portions of the tumor, which mainly comprises fibrous tissue, may increase in attenuation relative to the liver . The central scar usually shows minimal enhancement on arterial and portal-venous phase images and is best seen during the delayed phase (Fig. 26). The appearance of the lesion in the arterial and portal-venous phases reflects the enhancement of the cellular and vascular components of the tumor and the presence of fibrous and necrotic components. The relative homogeneity of the tumor observed on delayed images may indicate wash-out of contrast material from the more vascular areas, together with delayed enhancement of the fibrous lamellae (Fig. 27) [39,96]. 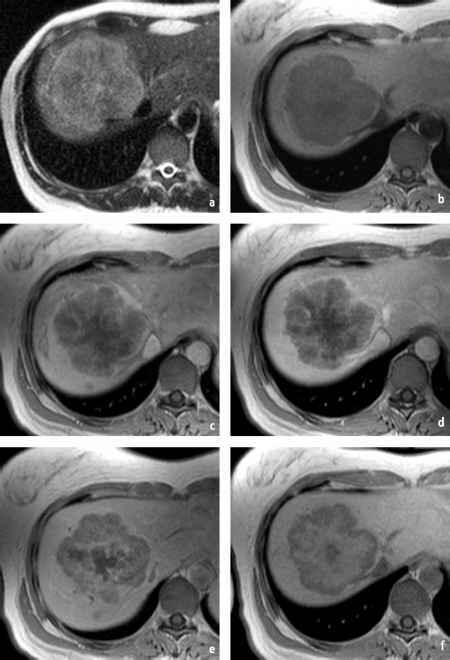 FLC is usually either hypointense or, rarely, isointense compared to the liver on T1-weighted MR images. On T2-weighted images, 90% of the lesions are hyperintense and the remaining 10% are isointense. 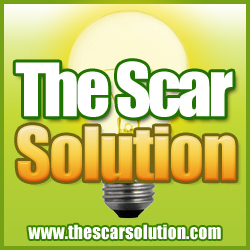 The purely fibrous nature of the scar means that it is hypointense on both T1- and T2-weighted images (Fig. 28) . FLC becomes heterogeneously hyperintense during the arterial phase after administration of gadolinium, and appears as isointense or slightly hypointense during the portal-venous and equilibrium phases (Fig. 29) [19,39]. 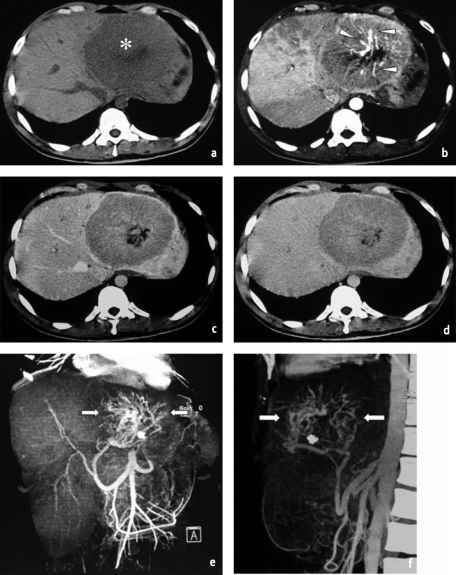 As on CT scans, the central scar shows minimal or no enhancement on hepatic arterial and portal-venous phase images, but may sometimes show persistent enhancement on equilibrium phase images (Fig. 30). 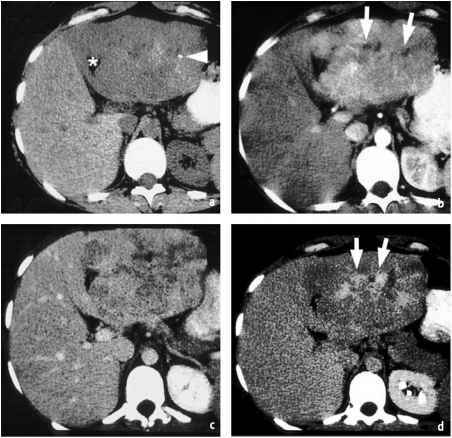 On images acquired during the hepatobiliary phase after Gd-BOPTA or mangafodipir trisodium administration, FLC usually appears as heteroge-neously isointense or hypointense with areas of low signal intensity due to necrosis or, less frequently, hemorrhage (Fig. 31). Irregular hyperin-tense areas, if present, may be related to the presence of fibrotic components. The lack of enhancement on delayed phase images is helpful in distinguishing FLC from FNH (Fig. 32) . FLC does not enhance significantly on SPIO-enhanced images. This absence of enhancement is helpful in distinguishing FLC from FNH in larger lesions, but may be less helpful in smaller lesions .